Whether it be to try novel foods, experience local cultures, learn a new language, or just to escape our day-to-day life, we all travel for a reason. When planning a trip, you may ask yourself, “How can I get the most out of this?”. We’re here with expert tips from real-life travelers who have made incredulous discoveries during their time abroad. Perhaps while sitting on a gondola in Venice, they had a life-changing epiphany. Or while laying on a beach in Bali they uncovered their path to happiness. Whatever revelations you make while abroad, we’re here to share what others have uncovered in hopes it’ll make your trips even better! What made you buy a ticket to Egypt? Going to Egypt has long been a dream of mine! Who doesn't dream of exploring the mysterious Sphinx, climbing inside the Great Pyramid and pondering recent geological discoveries that point to a civilization that may have created all of that as much as 12 thousand years ago? Riveting stuff! I run my own consulting business working to support startups in Silicon Valley and I knew this might’ve been my only vacation escape in 2018, so I wanted to make it an epic trip. I bought my ticket to Egypt and started planning! From where were you originally traveling? I live in a small town called Petaluma, one hour north of San Francisco, California, USA, a long way from Africa! What is some newfound knowledge you'd like to pass on to other travelers about Egypt? Egypt is divine! 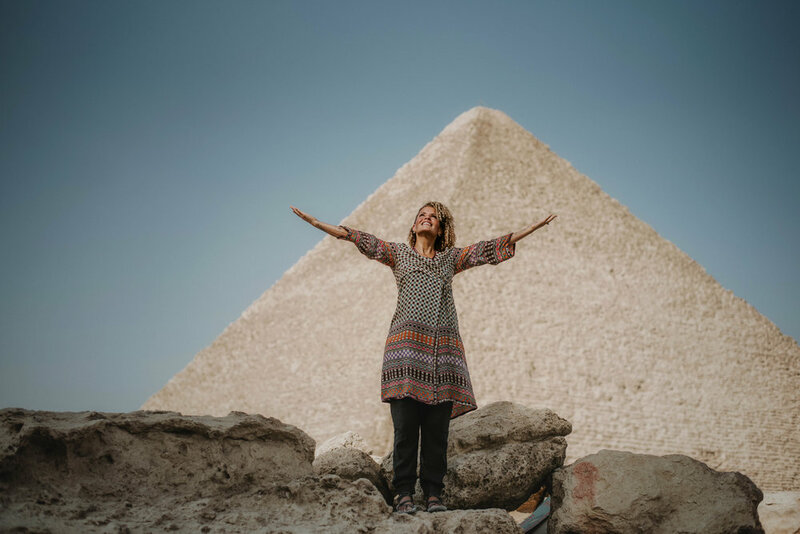 Not only are the ancient sites and temples incredibly preserved and stunningly beautiful, but the Egyptians themselves are warm, welcoming and lovely! I hired a guide that picked me up at the airport, got me quickly through Customs, organized my incredible hotel and driver in Cairo, all of our temple explorations, my flight to Aswan, boat trip to the Temple of Isis on the island of Philae, a 3 day boat trip down the Nile (do this!) and incredible meals of local food - delicious! I would definitely suggest getting a guide, especially as a female, solo traveler. My guide was an Egyptologist with 34 years of experience and up-to-date on all the fun recent theories and discoveries! He was so funny that some days my face hurt from laughing so much! What is one moment that will stay with you from this trip? why? My incredible guide was able to get me into the Karnak temple at dawn, just ahead of a bus full of rowdy travelers. For a few minutes, we had the sacred temple to ourselves and we walked through it slowly as he shared it's secrets with me. He also allowed me to open the chapel of Sekhmet (the lioness goddess) and I walked in alone to experience the palpable energy in the pitch black room. It was amazing, a moment I will never forget! Also, after a long hot day in the sun, I met my photographer Manar! Thank goodness I had booked her with SMT as my phone was dead and I would have no pictures of that magical day otherwise! She was incredible, cheerful and resourceful, I have the incredible pictures to prove it! Let us know if you enjoyed the first edition of our “Traveler Thoughts in…” series! Leave a comment telling us your favorite travel memory and where you’d like to see us go next!